Picture books delight us with their wide array of illustrations in differing styles. Each illustrator has his or her own style and approach that adds to the story. So what do illustrations look like before they are printed? Do illustrators experiment with different mediums before picking the final one? How do the characters come to be? 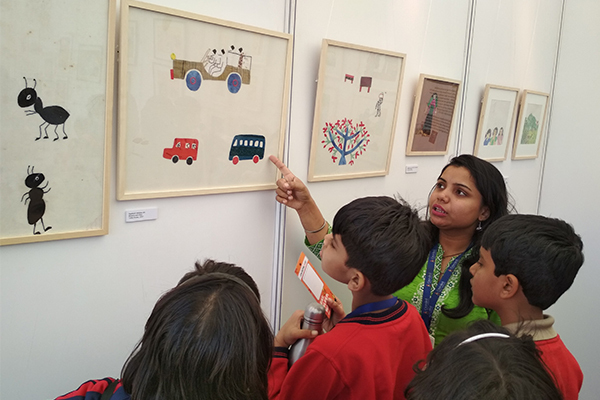 Wanting to delve deeper into the process, Big Little Book Award organised the first ever Book Art Exhibition with illustrations by the 3 BLBA winner illustrators — Atanu Roy, Proiti Roy and Nina Sabnani. The idea was to display original works from books, magazines and more. 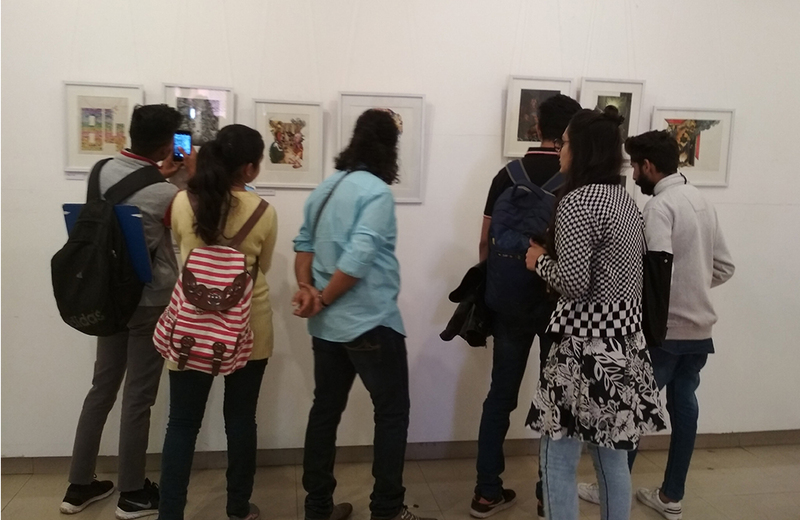 The book art exhibition happened in collaboration with Bookaroo at two venues in Delhi — India Habitat Centre and Indira Gandhi National Centre for Arts, and one venue in Jaipur — Jawahar Kala Kendra. 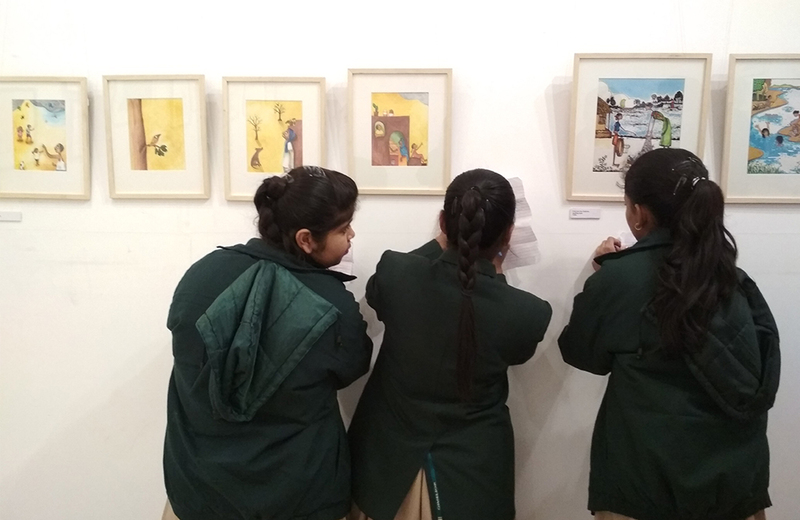 The exhibition was visited by artists, illustrators, publishers, schools, parents with children, passers-by, those interested in illustration, those not so interested in illustration, art, books or reading – there were people of all kinds. But it was fascinating to see how the framed works drew attention of every person who walked in, child or adult, interested or not. We began by collecting the original works from the illustrators, spending a day or an evening with them, immersing in a sea of art. That itself was a treat! Works of so many years and decades, so powerful, still so fresh. Illustrations in the books albeit have its appeal, but to look at their origin brings another feeling; along with visual, comes the tactile and the olfactory. And much more happens when framed and hung in the gallery, displayed to the world. Proiti Roy’s illustrations from her book ‘Gulla and the Hangul’ got people thinking. She uses textured paper for the illustration where the lined texture forms a uniform base to each piece, some latitudinally, some longitudinally. I overheard an argument between two school girls – one was confident that the lines were hand drawn, while the other was convinced it was the paper. 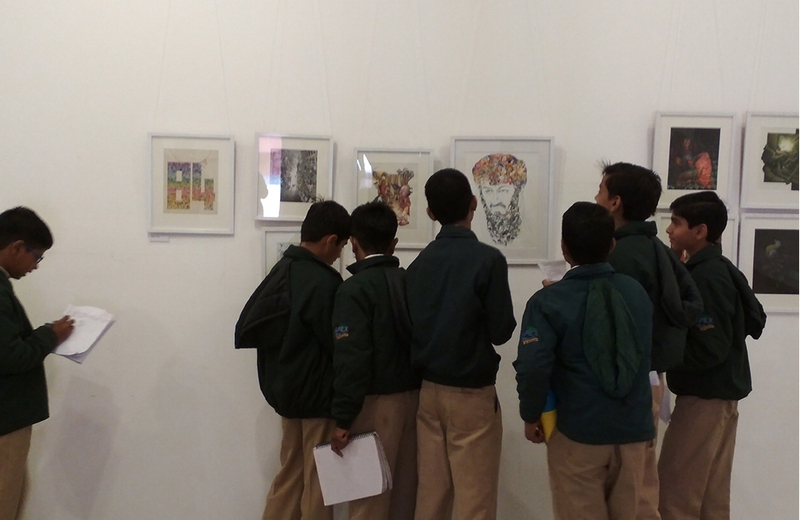 They later came to ask if there were illustration courses that we (Parag) conducted which they could join. Many mothers too expressed interest of their children in becoming an artist. They did not know that illustration was a profession within the world of art which could be considered. 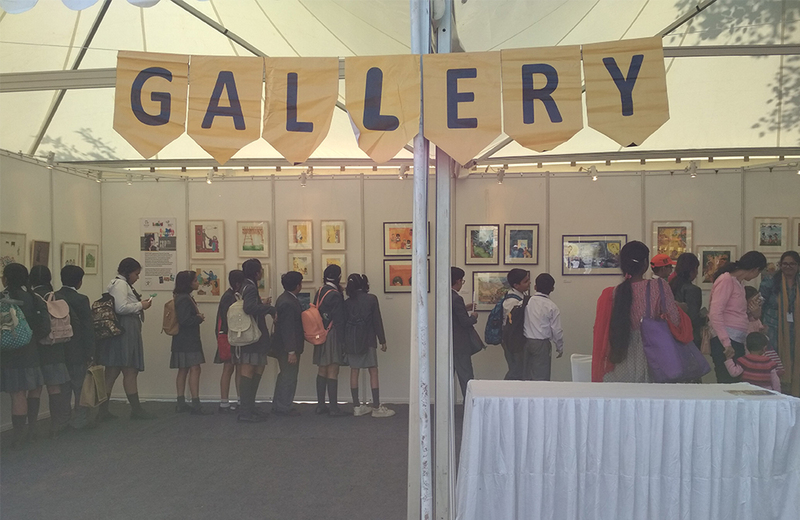 Familiarity was a great factor with many school children at the Bookaroo main festival. 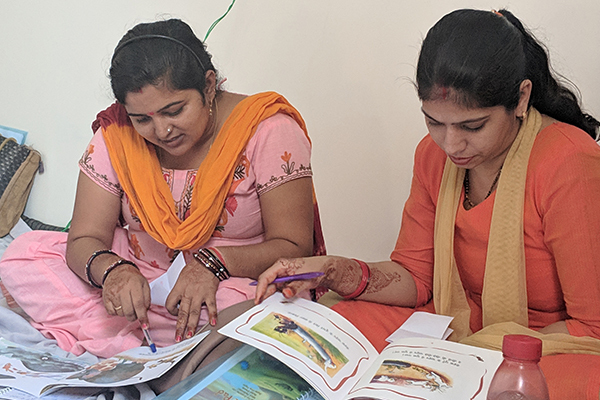 We saw them move from one frame to another in excitement of finding something they knew, called their friends and teachers to look at ‘Unhappy Moon’ and ‘Bulbuli’s Bamboo’ on the wall. They recalled the story. The illustrations were enough to captivate them and walk through the story without the book. 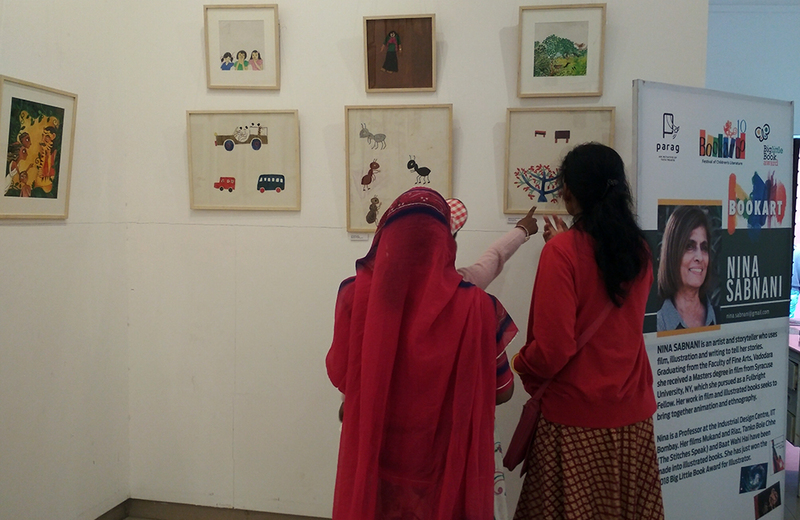 On another wall, Nina Sabnani’s works was creating a stir. Very little did one imagine that illustrations could be stitched! They knew about needle work and about picture books but had never assimilated both together. And the sheer awe when the stories, background of work, Nina’s way of involving community was told to them! The distinct characters, the expressions in the illustration, the colours, the intricacies and the very diverse nature of the 3 illustrators’ works were playing a role in arousing interest. “Who is Bon Bibi?”, “What is the story of Meghi Ben?” and questions galore. They wanted to know the story, the technicalities, forms, and what ‘style’ meant (the question for style came from the series of works on deciding style to show the amount of background work before selecting the final style). So, what was really happening? Looks like the illustrations were telling people what they already knew, but showing it all afresh in different ways. They were communicating to the viewer through the language of art, and because they were illustrations, they communicated through the stories to those who knew and the possibility of a story to those who didn’t; they weren’t art alone. To say the least, the book art exhibition was a catalyst. 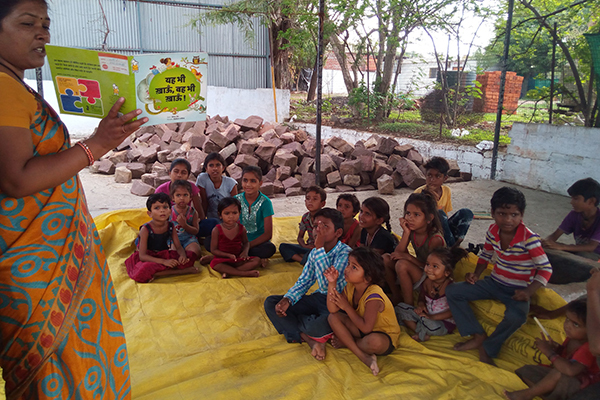 It got children and adults to think and ask, to engage with books and stories through the pictorial realm. 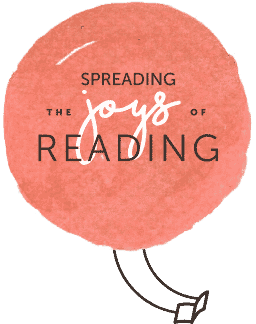 Since then a few parents have got in touch with us asking for picture book suggestions and magazine recommendations for their children. 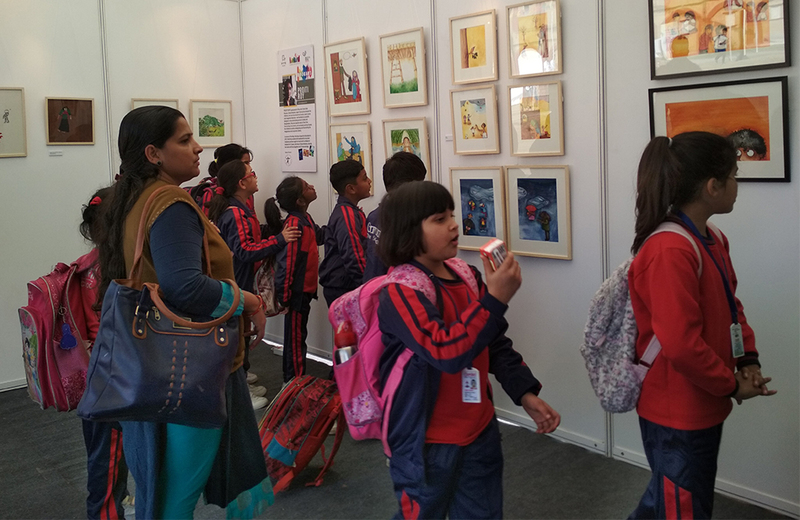 The Book Art Exhibition reiterated our faith in the power of picture books and their ability to evoke a response from one and all.